Who needs Donovan? Who needs a dreamer? Landon Donovan and a traditional offensive focal point were both absent as the United States secured their first victory over Italy. 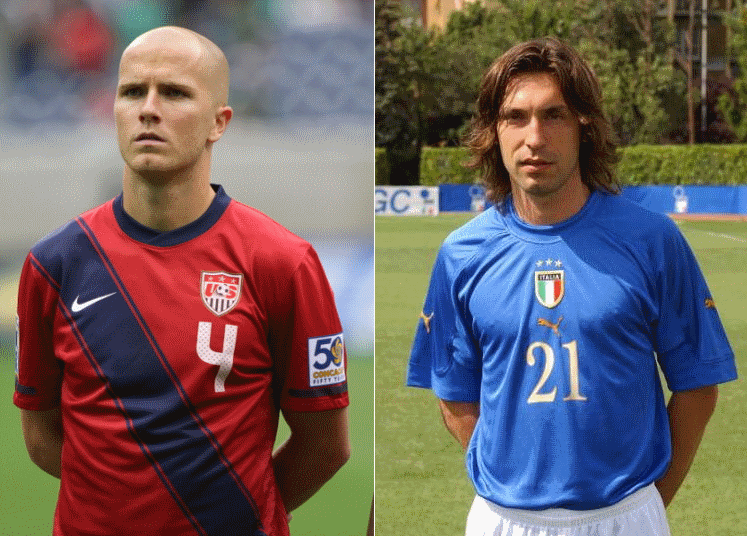 The Americans used Italy’s tactical weakness, as well as Clint Dempsey’s excellent form, to gain the lead; Michael Bradley did his best Pirlo impression to corral his teammates; and outstanding defending saw out the victory. The USA took advantage of the space on the flanks to threaten Gianluigi Buffon's goal. 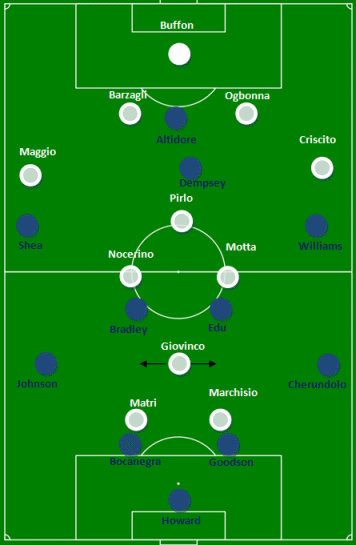 Italy manager Cesare Prandelli outfitted his side in a 4-3-1-2, while Jurgen Klinsmann brought out a 4-4-1-1. The Italians used midfield metronome Andrea Pirlo to control the middle of the pitch, and the Americans countered on the wings in the space left open by Italy’s wingerless formation. For no apparent reason, neither Clint Dempsey nor Jozy Altidore pressured Pirlo with much regularity. Dempsey was usually the player closest to the Milan/Juventus legend but rarely closed him down. Pirlo calmly threaded passes into the final third the entire match (completing 91 of 106 attempts). Pirlo’s control came to naught in the first half, as an organized backline (4 offside calls in their favor) and an excellent Tim Howard (5 first half saves) thwarted Italy time and again. Unfortunately, quality build-up on counters went unused as the Americans always fell to pieces in the final third. The second half, however, would see one sequence of brilliance in the Italian’s box. Klinsmann didn’t make any changes at the break. Prandelli brought on two subs, Riccardo Montolivo and Giorgio Chiellini, but the formation remained unchanged. The Americans then continued to attempt to create offense from the wings. Eventually they found a breakthrough. Of Michael Bradley's missed passes, all were either long punts forward or short passes in the final third. He was quite outstanding. Bradley – who actually completed a higher percentage of his passes than Pirlo, 91% to 86% – swung the ball wide to Johnson, who found Altidore in the box. The Italians had three defenders around Altidore and Dempsey, but Claudio Marchisio inexplicably lost track of Dempsey, the American most likely to score. Altidore’s tidy layoff was all the in-form Dempsey needed to beat Buffon in the far corner. Prandelli admirably solved his slight defensive problem by using his full 6 substitutes and changing to a 4-3-3. The US fullbacks were then pinned back, and the Italians began to go to the flanks more regularly. USA, now content to sit back for the rest of the match, coped with the changes without changing formations. The Americans saw off the match by defending with two bands of four, along with a deeper Clint Dempsey. The team defended well as a whole, with Carlos Bocanegra, Bradley, and Jonathan Spector (a late substitute for Fabian Johnson) putting in some outstanding individual efforts. Perhaps the lone second half defensive letdown was Sacha Kljestan, who was beaten twice off the ball by substitute right back Ignazio Abate, deep in USA’s half. Still, the Americans were remarkably composed and, though under heavy pressure, didn’t look likely to concede unless the Italians could string together a clever series of passes. Klinsmann deserves heaps of credit for the organized defense: Johnson was making his American debut at left back; Shea wasn’t even with the squad three days ago; and Donovan and Jose Torres were likely starters up to Saturday evening (illness and injury forced their withdrawal). The manager also needs to be lauded for his offensive strategy, as he took advantage of the glaring weakness of the opposition’s formation. But the victory wouldn’t have occurred without Michael Bradley and Clint Dempsey. Bradley was positively brilliant in attack and defense. He completed 43 of 49 passes, set up the goal scoring sequence, constantly relieved pressure with intelligent ball movement, and rescued his teammates on more than one occasion with savvy defending. Dempsey was equally impressive. He only completed 75% of his passes and created just one goal scoring opportunity for a teammate. But boy did he make his one shot from open play count. Gringos, what did you think of this win? Were you as impressed as FFG by Bradley, Deuce, and Klinsmann? Is Howard’s outstanding play so common now that you don’t even notice it? I’d just like to throw Edu and Danny Williams in there as well. Edu had some really nice tackles that lead to offensive breaks and Williams was big out there on the wing, especially in the last 15 minutes to help seal the victory. Looked like he still had plenty of legs left, or at least more than whoever he was marking. Edu was great and Williams was good defensively, especially in the last 15 like you said. But he wasn’t impressive going forward. I’m at the U-23 game at the moment, so I can’t look up his offensive stats. I can’t imagine that they were great. Then again, I don’t think Klinsmann has him out there for his offensive acumen. First, I felt Johnson did well enough at left back that JK can consider sliding Chandler to right back when needs to spell or eventually replace Cherundolo. At the least Johnson (and when Lichaj gets healthy) gives us some decent depth at a troublesome position. Second, all hail Michael Bradley! A masterful performance against a team that historically destroys their opponent’s midfield. The young Bradley defended smartly, distributed wisely, and basically played his a– off. It may not have been poetry, but it was workmanlike and very effective. I don’t know how JK doesn’t start him regularly at this point. Third, Williams is not a right mid- he just isn’t. I think Klinsmann should have seen enough by now to know. You can see he has tendancy to want to hold the ball and he just looks uncomfortable along the touchline. I’d really like to see him in Edu’s spot at least once, but his shortcomings in attack out wide create a real liabilty. Last, Brek Shea is a hot mess right now. While he did get forward and established some sense of width on the left (more so than Williams did on the right), too often a bad pass or miscue led to an Italian counter down that same flank. Shea did well tracking back into defensive coverage, but had he been less mistake prone he would have spent more of his time in the attacking half of the field. But overall, the team was composed and cohesive, very solid. They covered for each other in defense, and created just enough in attack to give Dempsey a quality finish. Italy can’t complain; they had the majority of possession and an abundance of shots. It was just nice to see us play well enough to earn a legitimate victory against a very good team. I agree on all counts, James. I too was a little worried about Shea. There were some bright and promising moments but he didn’t have that invincible confidence he often has offensively to take on defenders 1 v 1. I thought he was great defensively (as you mention). In his defense, though, 3 days before kickoff he was at home in Dallas planning on a relatively lighter match vs. Mexico’s U23s. That’s a big psychological shift to make. As an FCD man, I’m always pulling for Shea to show well. I think he just has some more maturing to do. I think this summer’s Olympics could be a huge chance for him to grow. Good analysis but one correction on the Italian side, as Marchisio wasn’t playing forward and Motta was the more advanced midfielder much of the half. And yes, Howard is that good. Cody, I definitely should have been more descriptive of Marchisio’s positioning. I listed what I saw as the base formation, but, you’re right, he was in the midfield more than he was up top. He and Giovinco had pretty fluid positions and I obviously didn’t make that clear on the chart. But, oddly enough, looking at the 1st half passing chalkboards of Motta and Nocerino, they show that even though Nocerino attempted more passes in his own half, he went forward just as much as Motta.